Legendary Sunday Times war correspondent Marie Colvin (Rosamund Pike) in A PRIVATE WAR. Filmmaker Matthew Heineman is known for his award-winning documentaries Cartel Land (2015) and City of Ghosts (2017), which both involve armed conflict but in different ways. In Cartel Land, which covers Mexico’s drug war from the perspective of two vigilante groups along the US–Mexico border, there was the very real risk of being shot. Although more dangerous during filming, that conflict was smaller than the Syrian conflict that Heineman covered in City of Ghosts. For that doc, Heineman embedded himself with members of an activist group called Raqqa Is Being Slaughtered Silently who seek to reveal the atrocities of ISIS in Syria. 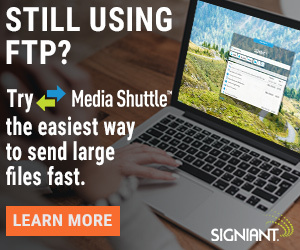 The group had fled Syria but was under constant, unseen threat from ISIS due to the footage they shared with global media outlets, supplied by their colleagues still living in Syria. It’s fitting that for Heineman’s first narrative feature he’d choose a subject who shared a common interest of reporting on armed conflict. A Private War tells the story of award-winning war reporter Marie Colvin, who courageously entered war zones and sent back stories of human suffering and loss. The film follows her into Sri Lanka (where she loses an eye from an RPG blast), Iraq, Libya, and finally Syria. It’s there, in Homs, that Colvin reached the end of her life’s journey. “Very early on, before we started shooting, I spent about a year doing research into Marie, to find out who she was. I interviewed her friends and colleagues, getting to know them and gaining their trust. That’s how I would have approached a doc,” says Heineman. 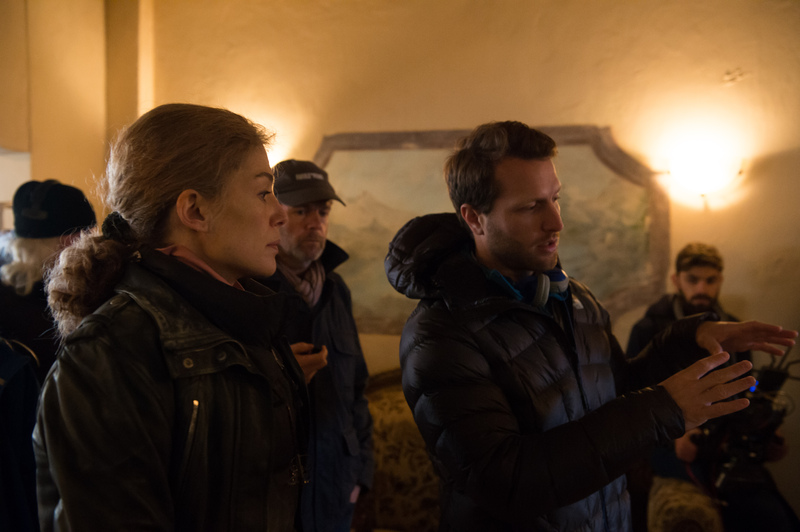 Behind the scenes: Rosamund Pike and Matthew Heineman on the set of A PRIVATE WAR. Unlike on a documentary though, a filmmaker has complete control over every element that goes into a narrative film — the script, the cast, the set pieces, the blocking, the camera angles, and the lighting plan. They can add VFX and practical effects. They can embellish the soundtrack with subjective design elements that reach beyond the realm of realism. They can manipulate any aspect of the film in order to tell their story most effectively. But even with all this control Heineman still wanted to leave room for improvisation in A Private War. For instance, he chose to work predominantly with non-actors as extras and featured extras. 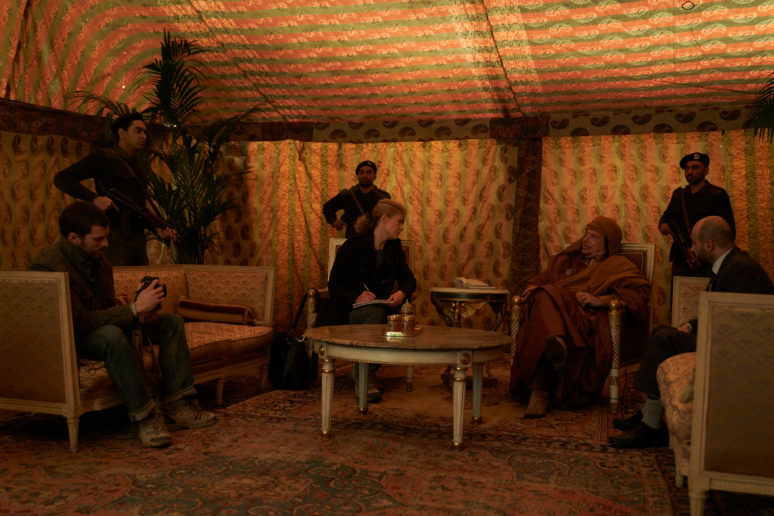 These were real refugees living in Jordan (where sets were built for all locations except London), who came from the various countries depicted in the film — Sri Lanka, Iraq, Afghanistan, Libya, and Syria. Heineman interviewed those refugees as if he were interviewing people for a documentary, trying to get their stories. Another example was the sequence they shot for a mass grave being unearthed in Iraq. Colvin and photographer Paul Conroy (played by Jamie Dornan) are joined by a group of bereft widows and family members who watch as a backhoe exhumes numerous skeletons from an open field. The screeching metal of the machine mixes with the women’s wails in a heart-wrenching way. It’s a visually and sonically powerful moment in the film, one that happened organically on set. That was a real backhoe digging a real hole, and the women who were wailing were real Iraqi women reliving trauma that they experienced. What you hear in the film is mainly production sound, with just a bit of extra metal screeching added in post. With a backhoe running underneath the recorded production dialogue on that scene, you’d think it would have been a nightmare to work with in post sound. But according to supervising sound editor Paul Davies, that wasn’t the case. 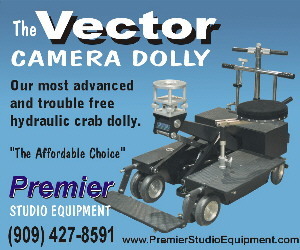 “Having the sound of that machine noise on the dialogue tracks, in the end, really worked to our advantage. In fact, there was surprisingly little technical ADR on the film. It was mostly ADR recorded for creative purposes,” he says. Sound editorial took place at Art 4 Noise in London. Marie Colvin (Rosamund Pike) and Paul Conroy (Jamie Dornan) scout the arid landscape in A PRIVATE WAR. Authenticity was also a driving force behind the sound effects, particularly during conflicts. Sound designer Bernard O’Reilly sourced appropriate weapon sounds that matched the make and model of those used during the battles. 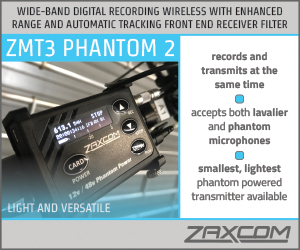 Also, the sound effects for photographer Paul Conroy’s camera are specific to the make and model that he used. 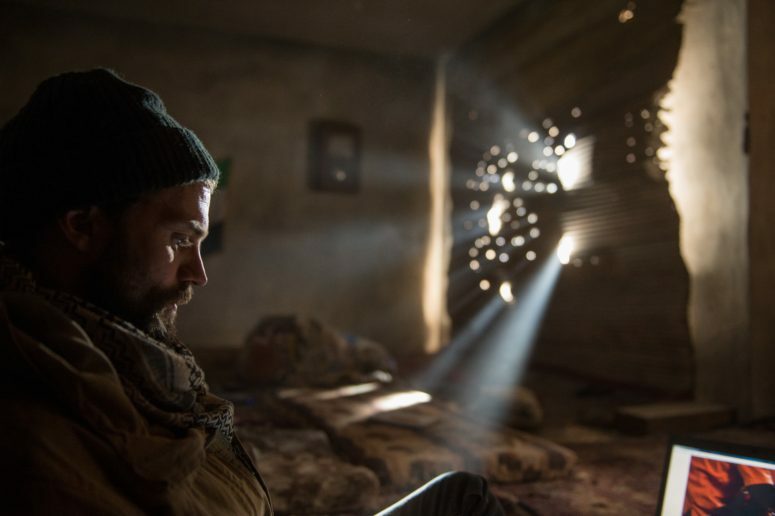 Photographer Paul Conroy (Jamie Dornan) waits out the attacks in Homs, Syria in A PRIVATE WAR. For example, Colvin and her group are riding into Homs in the back of a truck during the night. They’re trying to make it to a safehouse where other journalists are sheltering but they come under attack. 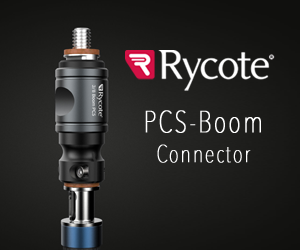 Their truck is armed with a large-caliber machine gun, but when it’s fired the sound isn’t your typical Hollywood action-film or war film gunshot that’s dominated by an explosive BANG. “It has this metal ring out instead. You get this shing – shing – shing when it’s fired. It made it slightly different but still kept the power. That’s what we wanted. We wanted it to feel a little more viscerally real,” says Stirk. The sound helps to widen the picture, to tell a story that’s beyond the frame of the lens — from the distant gunfire that Colvin hears as she’s sitting on top of a wall outside her hotel room, to the building-shaking explosions from mortars that are zeroing-in on the safehouse in Homs. “We were trying to create a soundtrack that was interesting, dynamic, and dramatic but also, at the same time, has a degree of authenticity and reality to it that’s not like a typical war film,” says Davies. Near the end of the film, the journalists’ building in Homs is rocked by mortars and bits of drywall and dust rain down from the ceiling. 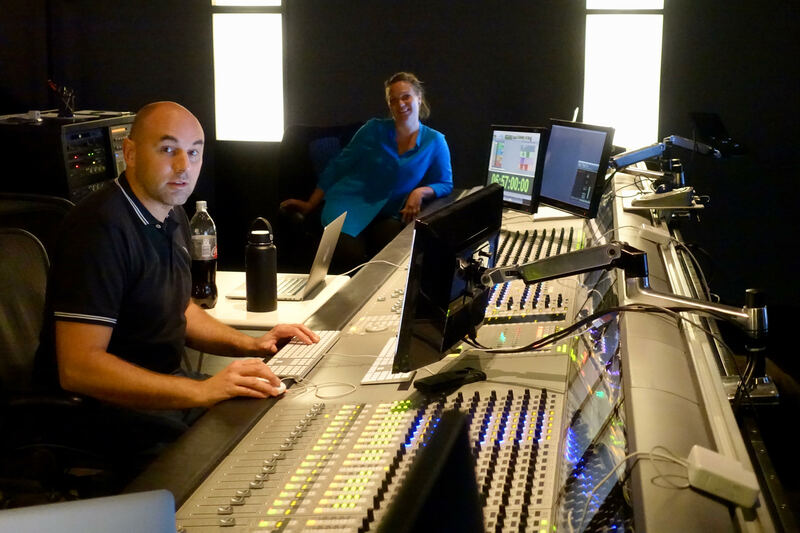 The weight of those explosions was created from a combination of roughly 20 effects tracks, while Foley — supplied by Universal Sound in Amersham, England — added the important detail of debris. “When the big mortars hit, they really had to hit. Everyone had to go ‘Whoa! !’ And if we got that reaction then we knew the sound was triggering the correct emotional response,” says Stirk. The most subjective aspect of the film is the portrayal of Colvin’s PTSD. When she’s back home in the calm and quiet of London, she becomes thrust back into the traumatic experiences she’s had in the field. She opens the door to her house and suddenly enters the stairwell of a bombed-out building. Or she suddenly sees a dead girl lying on her bed. In the film, Heineman treats the PTSD episodes more like reality instead of as stylized flashbacks. “People who suffer from PTSD have these traumatic images come back to them. They suddenly reoccur and it’s not a memory. It’s like you’re reliving that experience again. So, the PTSD scenes have a concrete reality to them as well as being subjective. It was quite a tricky little balancing act that we had to perform within those sequences,” says Davies. Marie Colvin (Rosamund Pike) in the limelight at the British Press Awards in A PRIVATE WAR. Stirk, who mixed the film in 7.1 surround at The Post Republic in Berlin, spent a lot of time sonically defining the story arc during the mix, making sure Colvin’s PTSD episodes progressed through the film, and making sure the conflicts progressed, leading to the climax in Homs and the scene of Colvin’s death on a bombed-out Syrian street. That final image — an overhead shot of Homs with buildings that are completely obliterated — was also the opening image. It’s a stark, desolate, and disturbing scene that bookends the film. That section of Homs was recreated using the set piece built in Jordon, which was actually an abandoned construction site. “We brought in some rubble and we dressed the first floor of the buildings. Above the first floor is all CGI,” says Heineman, who worked with the VFX team at One of Us in London. All the imagery they created for Homs was based on research from thousands of photos. Playing over the final shot above Homs, there’s a song called “Requiem for a Private War,” written by Annie Lennox and recorded specifically for the film. Heineman was astonished that Lennox imagined “the song as evaporating out of the dust of Homs, out of the dust over Marie’s body as this shot rises above the city” even before she read the script or saw the film. Without realizing it, she described exactly how the film ends. 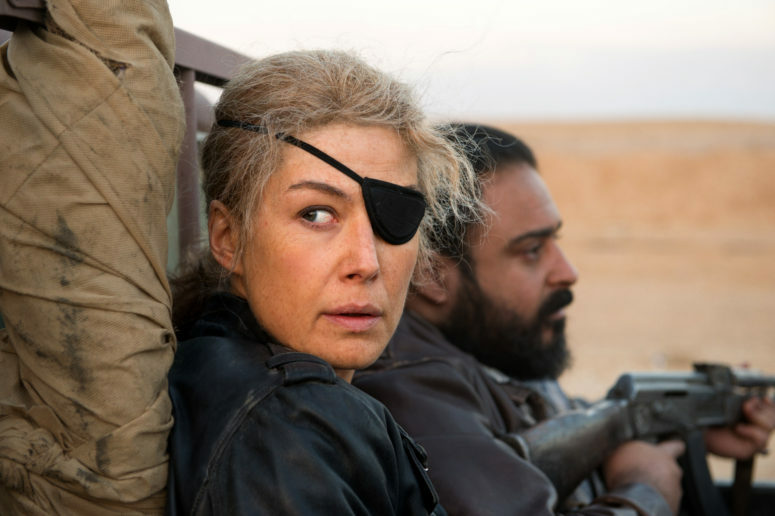 Marie Colvin (Rosamund Pike) treks the hot desert in search of the story in A PRIVATE WAR. 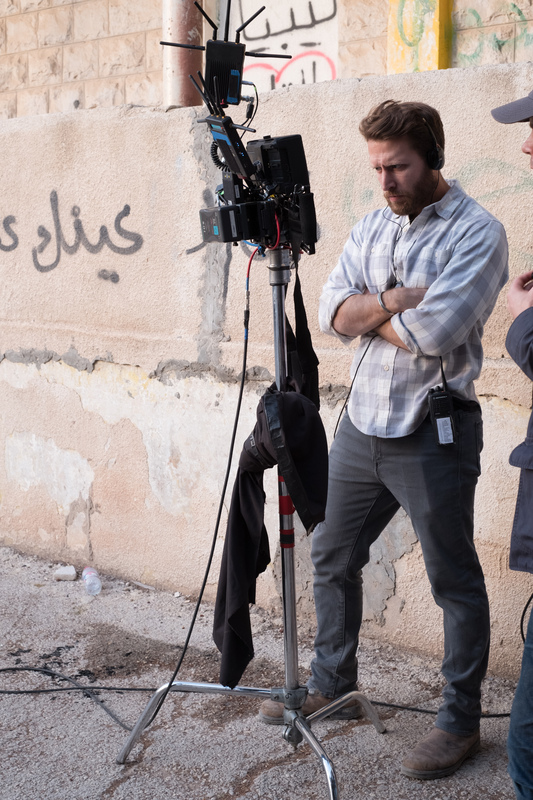 Director Matthew Heineman contemplates his next shot on the set of A PRIVATE WAR.